I’ve read at least a half dozen articles and blog posts in as many years warning gardeners not to use pressure-treated lumber because it contains toxic arsenic and chromium. It’s disappointing that these “experts” don’t know that since 2003 those two chemicals haven’t been used in residential lumber, aka lumber sold at big-box stores and most lumberyards. Pressure-treated lumber for raised beds, decks and fences is still for sale and still rot-resistant; however, it contains two very mild chemicals: liquid copper and quaternary ammonium. These modern chemicals are as effective at keeping fungus and termites out of the wood as arsenic and chromium ever were, but they are much safer—safe enough to use in wood for raised beds with edible plants, in fact. This type of lumber is now referred to as alkaline copper quaternary (ACQ) after those two chemicals. Liquid copper is just what it sounds like—a liquid form of the element copper—and because most modern water pipes are made of copper, the water you drink, cook with and shower in likely already passes through copper water pipes every day. Quaternary ammonium is the same product used in Formula 409 spray cleaner, and when sprayed in the air, some people can be sensitive to it, but in lumber, it’s bonded with the wood and doesn’t become airborne. Any that does leach into the soil would not travel far and would be very diluted. That said, if you are certified as an organic grower, you should check with your certifier, as there is some variation in what’s deemed acceptable and what can be grandfathered in depending on the organization. So What Kind Of Wood Is Used? Because treating wood with chemicals costs money, the lumberyards use less expensive wood to make it. That means in the Eastern U.S., southern yellow pine is used. It’s heavier, denser and more likely to twist than other more expensive pines, so it’s harder to drive a nail into. And you may need to use more nails—or, for better holding power, screws—to keep your raised beds from twisting. On the West Coast, pressure-treated wood is commonly made from hemlock for the same reason. It’s a less desirable wood than the lighter and straighter West Coast spruce, pine and fir commonly used for framing houses, but once it’s been treated, it’s more expensive. The benefit is that pressure-treated lumber will last as long as 40 years in contact with the soil. Raw, untreated pine or hemlock used for a raised bed will only last about five years in areas with intense weather conditions. Heavier woods, such as oak and maple, will last just a few more years but will cost considerably more. 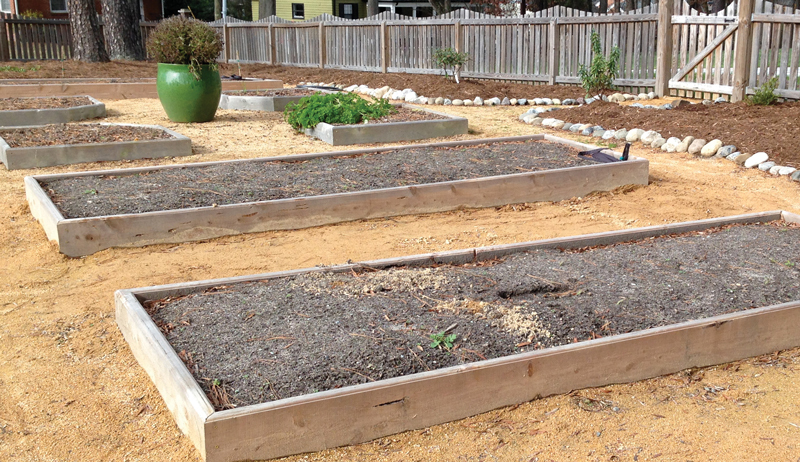 Natural alternative woods for raised beds include redwood, cypress, white cedar, and both eastern or western red cedar. These woods often cost more than pressure-treated lumber but generally will only last about half as long. Even that comes with a caveat: Only the dark-­colored heartwood of these trees will resist rot. The outer, lighter-colored sapwood will rot away as quickly as untreated pine, so make sure you’re buying solid planks of heartwood unless you want to be rebuilding your raised beds twice a decade. This article originally ran in the September/October issue of Hobby Farms.